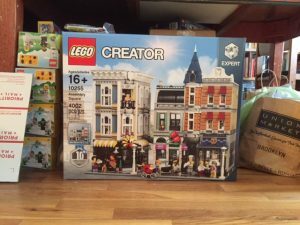 Home » Blog » Little Brick Township Is Growing! Little Brick Township Is Growing! 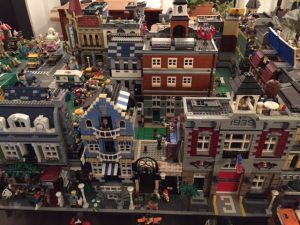 Several weeks ago, a LEGO enthusiast and writer contacted me for an interview. Her interest made me realize how long it’s been since I updated my photos of Little Brick Township. Problems with my iPhone battery, the election and its aftermath, and a new teaching job have significantly reduced the time I’ve spent on Instagram, and my followers there haven’t seen the township since I added my deli MOC and tiny houses. Recently, I found a workaround for the battery problem, and I hope to put up more Instagram photos in the future. The front of Little Brick Township, from left, Grand Emporium, Pet Shop with two identical townhouses, Green Grocer, Cafe Corner. Behind Cafe Corner are Brick Bank and Detective’s Office. I sent Julia, the interviewer, three new photos of Little Brick Township with the additions. I have also acquired the new Assembly Square Modular, but I haven’t built it yet. Assembly Square (#10255) is the 10th anniversary Modular set, and it contains elements from all the Modulars that preceded it. It is also one-and-a-half baseplates wide (48 x 32 studs) instead of the typical 32 x 32-stud baseplates of the other Modulars. Little Brick Township contains every Modular released beginning with Cafe Corner (#10182) in 2007. 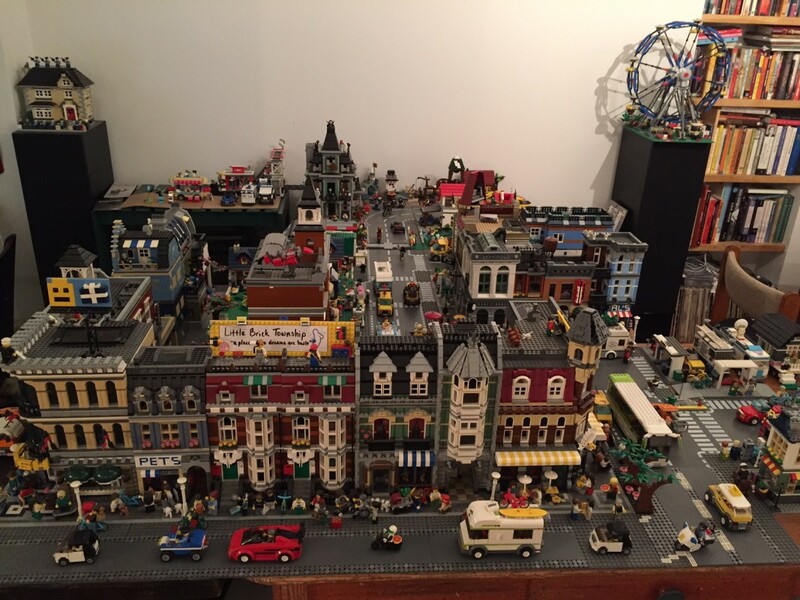 As I told Julia, my LEGO building — for myself, rather than with children — began in 2007, after my son had sold his Pirates and Castles and left for college, leaving his room empty for my creations. After Cafe Corner, the next two buildings to join my town were the Green Grocer (#10185) and Market Street (#10190). I purchased and built both of them in 2008, although Market Street, the only Modular designed by a LEGO fan and not by the company itself, came out in 2007. After these three sets, LEGO began to release Modulars on a once-a-year schedule and I waited excitedly every year to see which ones would appear. 2009’s release was the Fire Brigade (#10197), and the Grand Emporium (#10211) came out in 2010. The left side of the township, from left, Parisian Restaurant, Market Street, and Fire Brigade. Behind them are the backs of the MOC Deli and Town Hall. The Pet Shop (#10218) from 2011 was one of my favorite releases because of the two separate buildings on 16 x 32 baseplates, a dark red townhouse and a blue-gray and white pet shop/apartment, that can be split and combined with other Modulars in different ways. I bought two of them so I could put the dark red townhouses together to evoke a block of identical townhouses as one would find in much of Brooklyn. After living in Portugal in 2012, I hung a clothesline between my two townhouses and a neighboring pet shop/apartment building, inspired by the clotheslines of my adopted city. When I built the Town Hall (#10224) in 2012, I originally planned for it to be the center of the town and even wrote a post describing why. 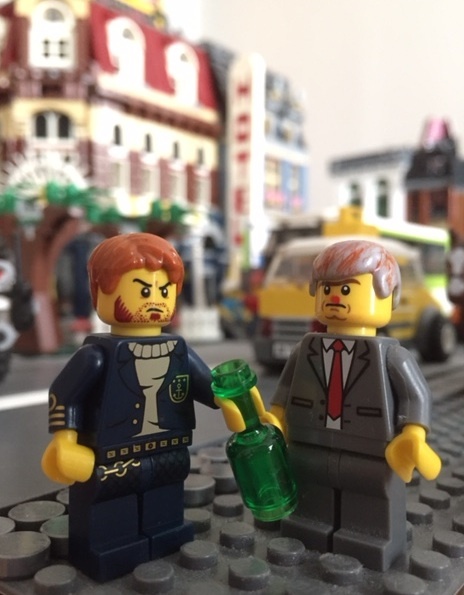 I surrounded Town Hall with a park, but since then, development has encroached on my green space, and last year, the Town Hall acquired a neighbor, my MOC Deli. Assembly Square is slated to go up on the other side of the MOC Deli, which will shift the Town Park one-and-a-half baseplates further toward the edge of town. 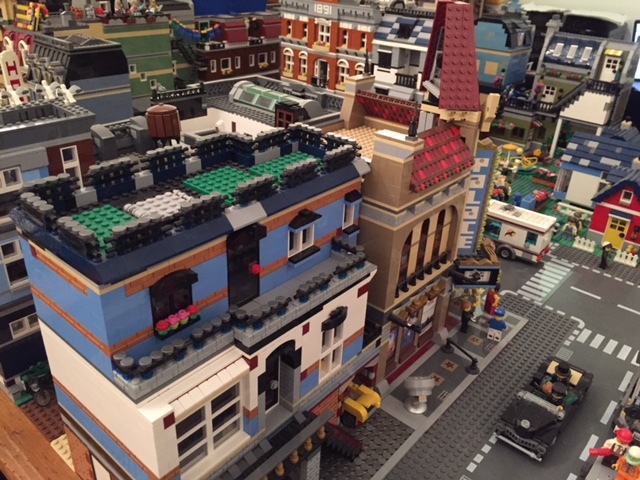 Looking at the township from the right side, with the MOC radio station and the Palace Cinema. With the Palace Cinema (#10232) in 2013, I started another block in my township. At first, it was supposed to be the red-light entertainment district, caused by a crooked deal involving Mayor Slik. But the good folk of Little Brick Township imposed their will via the judicious use of their dollars, and two years later the entertainment district had become entirely family-friendly. In between, in 2014, the Parisian Restaurant (#10243) took its place next to the Market Street. 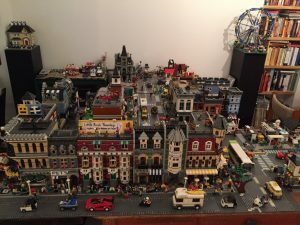 In 2015 all of Little Brick Township moved from Albany to New York City, and the now respectable Palace Cinema welcomed two new neighbors — the Detective’s Office (#10246) and my first Modular MOC, the Radio Station. 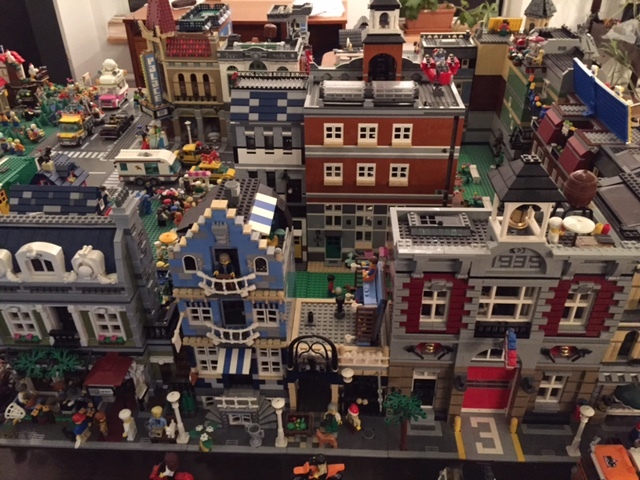 With the addition of the Brick Bank (#10251) in 2016, the former red-light district was now a full block of beloved town institutions, with small parks, street trees, food stands and homes large and small, Creator sets and MOCs, to add to this delightful community. Assembly Square, still in the box next to bags of bricks for future MOCs. That said, dark clouds loom on the horizon. Little Brick Township is running out of space, and a MOC-building freeze has been declared. I’ve been on the hunt for larger quarters for the township, a process that may involve application to the City of New York for artist certification. Furthermore, two villains, with the support of town 1%ers Rand and Giovanni, have plotted a hostile takeover, which may require an emergency relocation in the dead of night. If the township moves, it’s easier to transport in an unopened box rather than going through the process of shrink-wrapping, bubble-wrapping, taping, boxing or crating, and shipping — though as my experience of moving from Albany to New York City and of shipping Dirty War House to the Netherlands attests, the latter can be done with minimal damage. Anyway, enjoy Little Brick Township today! 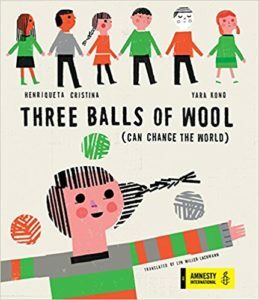 And stay tuned for news to come! 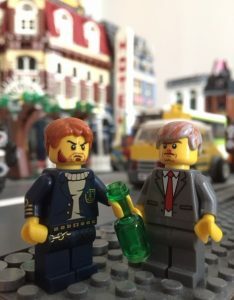 Villains Hair Furor and Drunk Nazi Blogger plot a hostile takeover of Little Brick Township. Wow, Lyn! Little Brick Township looks wonderful! Thank you! I’m getting to the point of running out of space and having to make hard choices, though. I really don’t want to sacrifice green space for buildings.